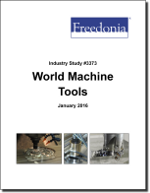 This study analyzes the $138 billion world machine tool industry. It presents historical demand data (2004, 2009 and 2014) and forecasts (2019 and 2024) by product (metal cutting, metal forming, accessories and spare parts) and market (e.g., machinery, transportation equipment, primary and fabricated metals, electrical and electronic equipment) for six world regions and 17 major countries. Total demand is given for an additional seven countries. The study also considers market environment factors, details industry structure, evaluates company market share, and profiles 39 industry competitors, including Sandvik, TRUMPF, and Yamazaki.